To mark the centenary year of Armistice, 24 silent Tommy soldiers have been installed in various locations across the borough to commemorate British and Commonwealth soldiers who served in World War One. Organised by the Royal British Legion, ‘The Silent Soldier’ project aims to ‘educate’ today’s younger generation, and ‘heal’ today’s veterans who are suffering from mental health and physical wounds, by raising substantial funds through the sale of ‘Tommies’. 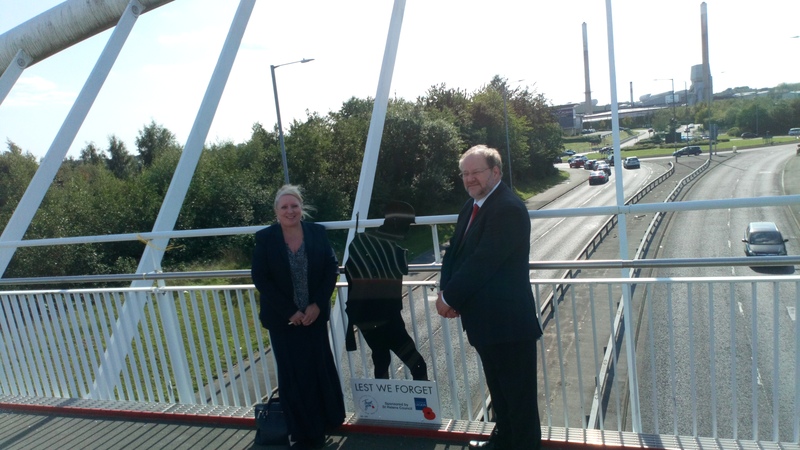 The Mayor of St Helens, Councillor Pat Ireland announced that St Helens Council would be supporting the poignant project at a full council meeting in July. Many of the four-foot silhouette figures have been placed close to train stations to highlight the fact that many soldiers were given a train ticket to return home after the war – while others have been placed in parks and along the side of roads as a fitting reminder that soldiers could often be seen walking across fields and along roads when returning home to their families. St Helens Council is sponsoring 19 of the Tommies, while Rainhill, Bold, Eccleston, Rainford and Windle Parish Councils have each taken on a Tommy, too. Showing her support to the campaign, St Helens Council’s Armed Forces Champion, Councillor Lynn Clarke – who has sponsored two Tommies which are to be displayed in Newton and St Helens cemeteries – said: “As a council, we are committed to supporting our armed forces personnel, past and present – so I’m delighted that we’re sponsoring these Tommies which will help raise funds for veterans, and hopefully get people to stop and pay attention to the figures in respect of those who sacrificed so much.